Anyone who has experienced the better parts of Lima Peru after dark has surely enjoyed the smells coming from the Anticuchos grilling around town. 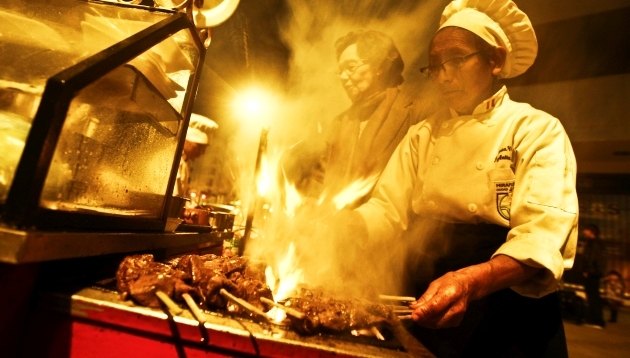 Anticuchos and Pancita are a favorite night street food around Lima. My favorite stands are the ones in the local areas you will know a good place when you see alot of the locals chowing down. Anticucho is marinated beef heart thinly sliced served on bamboo sticks seared on a hot metal grill on top of mesquite wood. It is spiced as is the pancita or cows tripes seasoned in hot spice and grilled as well. Sideds include papas and choclo if you are up for a completo. Copleto is s./8 and solo anticuchos go for s./5 for three sticks. Do not forget the add your own chile aji bar on the front of the carts. I pour the red hot ricotto aji all over my beef and the yellow aji for the papas. Kids can also enjoy as they usually have ponchas or hot dog on a stick grilled as well. 10. Eat Cuy Picante. Try the woodsmoked spicy classic of Peru. 9. Visit the Natural Springs of Curawasi in the Apurimac Valley. Float the Apurimac River via Canoe or Kayak. 8. Visit the Cebicherias and Disco Tech’s of the Lima Metro area or catch a soccer game. Located Just a 5 minute taxi ride from the Plaza de Armas in Cusco, Peru. This National Historic site represents the remaining Inca City which was not destroyed by the Spanish invasion. There are tours and a ticket counter is at the entrance. Be wary of locals selling fake passes near the ticket building. Horse stables are nearby and locals are known for vending fine alpaca hats scarves and blankets off the road past the ticket booth. About $20 Admission estimate take nuevo soles. Plaza De Armas, Lima Peru. Here you will find the main Cathedral which is very exquisite but I have only seen it open once during serveral weddings held at once. It is the finest in the country although I do believe the cusco ones are older. The Pizza place is a great place for food as is the Chabuca Market just to the South West of the Presidential Palace. The square had lots of food and Jiron is full of shops, from plaza vea to tipitop. There are 2 movie theaters a norky’s, although Campestra is close by and the best in Peru. Plaza St. Martin is good for travel agencies with airline deals as well as a great place to change your dough. 5. Visit the beaches of the SUR or El Norte. 4. Visit Cusco and all Inca Heritage Museaums. 3. See the Nazca Line Ancient Unknown Peruvian Archeological landmarks. Don’t forget to get souvenirs of alpaca hats and other artisan gifts in markets around lima and cusco. Email for Direct Sales. We Currently have gift items available on ebay as well. In upcoming posts we will discuss our top 10’s of Peru. There are a couple of secrete ingredients which Mama Satu didnt want to give up so they will remain secrete. To some the missing ones will be obvious if you are unfamiliar you may guess. Beginning Spring 2012 we will begin offering guided tours throughout Peru. Travel to Peru and explore with the help of a private guided tour with a bilingual guide. Day tours of Lima and Lima night life beginning soon. Want to go on a Surf Safari ? Or maybe just a surfing lesson? Maybe explore the markets, shop for souvenirs, sample the local food, head out to the disco or night club and see Lima’s Hot nightlife, or simply enjoy a tour of one of the many historic points of interest in and around Lima. The Most intriguing thing I have experienced in Peru was being handed my gaseosa ie my soft drink or soda in a clear plastic baggie knotted at the top. During my travels I have found it very intriguing how Peruvian’s use plastic baggies for nearly everything. They use them for nearly everything. I suspect this is normal for most undeveloped countries as they are a cheap means of packaging. I have to admit it is a little strange I have to say as I know they have styro foam containers at the chifa restaurants and at most of the pollo braserias for take out meals. But when I go to the market for a meal to go they always pack my drink or beverage in a clear plastic baggie knotted at the top. I have to say the only place I have actually drank them is from the Pizza Palace in Lima Center after walking home. Its just different but for me I prefer a paper cup…..Usually I would prefer an ice chilled glass beer stein however! Lima is a big city and the people stay very busy. Lima’s 10 million inhabitants normally work 5-6 days a week from 8am-9PM so they must eat quick and normally on the run. While traveling around the city of Lima you will encounter various types of street vendors. A good way to identify good food from the street Vendors is to look for where the most locals are eating. That is always a good sign. You will notice many in the Chabuca area near the Plaza de Armas that are all in white carts. These vendors are inpected by the municipality and are normally the cleanest and safest to eat at. 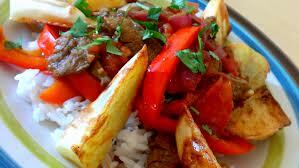 My favorite is the Anticouchos or kabob of marinated beef heart and pancita which is marinated beef tripes or stomach usually served along side of boiled potato slices and your choice of hot sauces. Hot sauce is my specialty and Peru has many unique types of peppers such as the aji amarillo and the ricotto pepper. Normally you will have a choice of the 3 main salsa’s at most vendors stands. Aji de huacatay, Aji Amarillo and The rojo ricotto. My favorite is the red ricotto sauce and it is very hot so watch out. Other street edibles include papas relleno which are mashed potatoes made into a ball and deep fried with olives, hard boiled eggs, some hamburger inside. Another is Arroz con leche, a sweet white rice and sweet condensed milk with cinimon an d raisins on top. There are many vendors selling different types of caldons or soups of camote (sweet potatoes) and chunos (small dried potatoes native to the Andes) and a favorite in Cusco. You will also find gelado (ice cream), picaronnes (fried sweet bread with molasses), choclo con queso, choclo con papa and juevo con papa, conchita (pop corn), flan and creme brule to name a few. We will go into each in further detail later on.